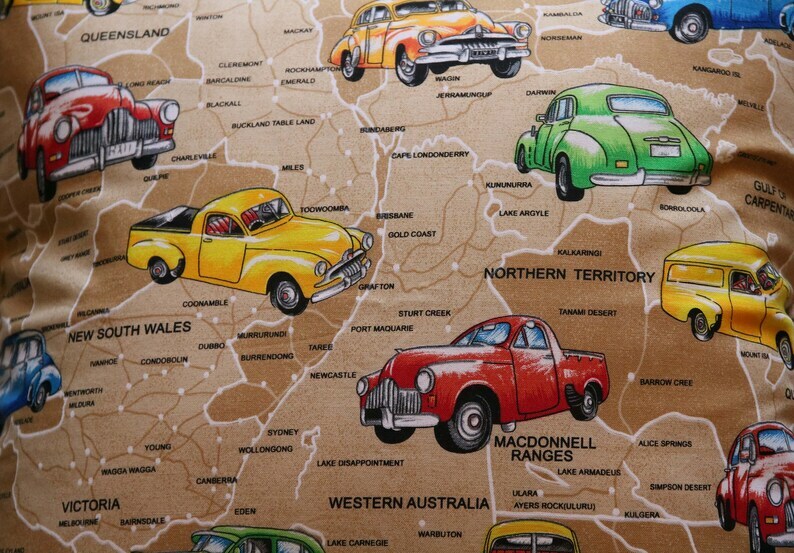 This beautiful cushion cover has been made using quality fabric and has an Australian Vintage Car theme. It also has a Road Trip theme going on as well. There is a stitched edge for effect. The cover has an envelope style opening in the back for easy insert removal. This lovely cushion cover would be perfect for the caravan/camper van or just taking along on a road trip. It is now available and ready to ship. CARE INSTRUCTIONS: Warm/Cold Machine Wash. Line Dry. All handmade purchases will be sent using Australia Post Express Post or Australia Post Standard Airmail with tracking. If you require Registered Post etc., please contact me so that I can give you a firm quote. Insurance coverage can also be added if required. Shipping outside Australia may take 2-3 weeks and some countries may require a customs tax which the purchaser WILL HAVE TO PAY.